What was your first Compact Disc? Discussion in 'The Studio Lounge' started by semipenguin, Nov 19, 2008. What was your first CD (& I don't mean Crossdresser, BMF... )? Bought in 1987 when I got a Sony Discman portable CD player. Public Enemy--It takes a nation of Millions to hold us back. Bought in 1988 or 1989, I guess. I just remember the cardboard packaging that the CD's used to come it. I would be really carefull opening the CD's so I could then hang the cardboard warpper on my walls like a poster. Then "recycling" became big and the record companies stopped using the cardboard packaging. "Discipline" by King Crimson. I also bought a Sony Discman sometime in the late 80s, and that was the first CD I bought. See, I had an actual CD player before I had a discman. 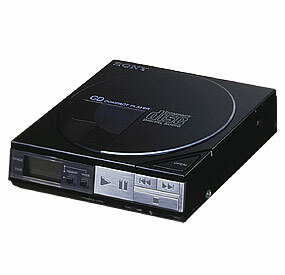 I saved my own money and bought the CD player (a pioneer 6 disc CD player--the cartridge loading style) after Christmas. keep in mind this is impressive because I was 10 or 11 at the time. I didn't have a discman for a while. God, remember how much those things sucked? They would SKIP constantly. If you coughed near the discman it would skip. They sucked. It had a giant battery pack that it plugged into if you wanted to carry it around. It totally rocked. Oh, and I think I bought it in 1984. That thing is ridiculous. They weren't big on portability back then. "Five Man Acoustical Jam" by Tesla in 1990. I was slow to the party, apparently. Still have the CD player, a single disc rack component by JVC. 18 years old--wow. Mine was Jane's Addiction, Ritual de lo Habitual. I still have about 50 of my first ones here some where. I cut out the fronts and had them on my wall as a teenager. I remember like it was yesterday cause the CD walkman that I got to play them on SUCKED!!!! It was WORSE than Michael Jackson! Battery lasted 20min and it skipped if you walked with it BUT WE LIKED IT! What are you talking about? It was barely bigger than a stack of 4 CDs. It was the only portable CD player at the time. Everything else was as big as a turntable. Mine came with a shoulder holster. Mine, too. There was a big plastic battery holder it clipped onto, and a shoulder strap so you could wear the whole thing. Very geeky. Very cool.